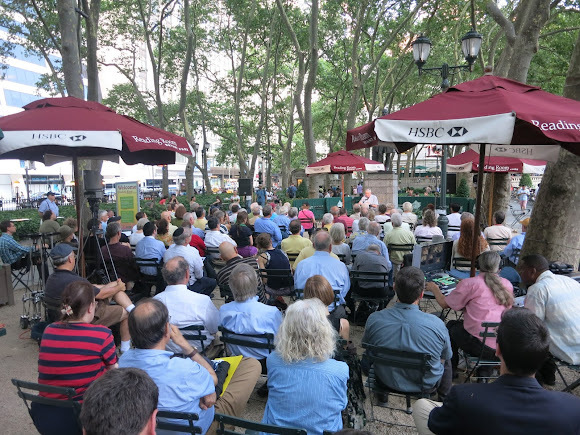 Join us in the Bryant Park Reading Room sponsored by HSBC as Lily Koppel shares the inside story of the women behind the Mercury Seven astronauts in The Astronaut Wives Club: A True Story. Koppel explores how the women formed strong friendships to help them cope with the unexpected fame, the fear of the unknown missions their husbands were undertaking, and the loneliness and jealousy they endured after their husbands were chosen to lead the space race. Many of the women became neighbors, helped raise each other’s children, and forged friendships that lasted more than fifty years. Koppel will be hosted by singer and writer Alina Simone with her debut novel Note to Self. You'll want to return on Wednesday evening for a special presentation of the New York Historical Society for Word for Word Non-Fiction. Sam Roberts will lead a talk on Grand Central: How a Train Station Transformed America. Other highlights this week include Storytime for the kids with Cali Co Cat, a Book Club discussion on The Hound of the Baskervilles: Another Adventure of Sherlock Holmes by Arthur Conan Doyle, a Fiction Writing workshop, and a poetry reading from Sibling Rivalry Press.